The Schwarzbein Principle is written by Dr. Diana Schwarzbein who is an endocrinologist who worked closely with Type II Diabetic patients in her practice. She noticed that her patients were responding poorly to the conventional dietary treatment for diabetes of a low fat, high carbohydrate diet and when she adjusted their diets her patient’s health improved and they lost weight. The focus of the book is on the connection between dietary carbohydrates and insulin levels. However Dr. Schwarzbein stresses that her program should not be regarded as a diet, but as a lifestyle approach to improve general health, boost vitality and reach your ideal body weight. She points out that it is not just about losing weight, but about improving wellbeing and balancing the body’s physiology. She explains that sometimes when we make dietary changes to improve our health we may actually gain a little weight initially but as the metabolic equilibrium improves the weight will eventually come off. In addition to diet and exercise recommendations Dr. Schwarzbein is a proponent of nutritional supplements as well as hormone replacement therapy when used appropriately. The diet involves two stages. The first stage is designed to heal the metabolism and is basically a high protein, low carbohydrate diet that is very similar to the Atkins diet. During this stage dieters are advised to center their meals on protein foods, healthy fats and non-starchy vegetables. It is also recommended to never skip meals, drink plenty of water and to eliminate alcohol, caffeine and artificial sweeteners. Refined carbohydrates including bread, pasta, cereals and sugar are also removed from the diet as these foods trigger insulin levels to increase excessively. During stage two, which is referred to as the maintenance phase, dieters are advised to experiment adding in more carbohydrates to the diet to discover the amount that is right for them, where weight gain or other adverse effects on health do not occur. Dr. Schwarzbein also explains that while carbohydrates are reduced initially, they are an important part of our diet, and in contrast to the Atkins diet she states that it can actually be dangerous to eliminate carbohydrates entirely. Those who are physically active are advised to consume a higher amount of carbohydrates than people with a sedentary lifestyle. The diet is initially focused on protein foods such as meat, seafood and eggs. Butter and cream are allowed and non starchy vegetables are the main source of carbohydrate in the initial stages. As the dieter progresses into the maintenance stage the variety of foods increase to include more fruit, low fat dairy products and whole grains. A combination of aerobic exercise, resistance training and flexibility are recommended to promote balance in the body and heal the metabolism. 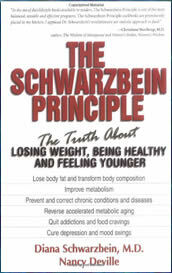 The Schwarzbein Principle and The Schwarzbein Principle II cost $11.95 US each..
Several exercise DVD’s are also available for a cost of $19.95-$29.95 each. Medications and nutritional supplements may be advised depending on the individual and this is an additional cost to be considered. Balanced approach that addresses nutrition, exercise and other factors that may be influencing weight loss. Especially suitable for diabetics, those with insulin resistance or women with hormonal imbalances. Progress may be very slow as it can take many months to ‘heal’ the metabolism before weight loss occurs. The recommended nutritional supplements are very expensive. May require additional medical tests and pharmaceutical treatments. In essence the Schwarzbein Principle is similar to many other reduced carbohydrate diets but where it differs is with the emphasis on eliminating toxins and improving physiology and hormone balance. Dieters who have tried many different dietary approaches without success may achieve results on this program however it will be necessary to work closely with a medical professional in order to experience optimal benefits. It will also be necessary to accept that progress may occur very slowly and that weight loss will not occur immediately. However the positive lifestyle changes will probably lead to an improvement in general health and vitality within a short time of commencing the program. Schwarzbein, D., & Deville, N. (2010). The Schwarzbein Principle: The Truth about Losing Weight, Being Healthy and Feeling Younger. Health Communications, Inc.. This diet is a food plan that can bring you to the point that your body is functioning naturally and healthfully. This lady is great! Thank you, doc. My husband and I started the Schwarzbein Principle Healthy approach to living and boy has it been a success. My husband went to the Doctor a few weeks ago and not only has he lost weight but has fixed his blood pressure, cholesterol, and all his levels have gone to the better. We are leading a more healthy life style by changing how we eat and how we look at the overall picture of processed and contaminated foods only because of the reading from Suzanne Somers books that lead me to Dr. Schwarzbein..She has changed our lives and will continue I just bought a new book and am pleased that we are focusing on our lifestyle changes. I owe a lot to a more holistic approach through Dr. Schwarzbein and how she has changed our lives. I was suffering from adrenal disease, high blood sugar levels and a few more things and my improvement has been a blessing. I feel that people miss judge her program. Being patient and sticking to it has lead us down the road to a healthier lifestyle. I got rid of all process foods or anything in a box, we live day to day on whole foods..vitamins..exercise..and WOW!! our lives have changed and so can others you just have to be patient and diligent about the program, if you want something really bad you have to work at it..
i tried the diet, it was a total bum!